One of the reasons in visiting Raja Ampat Regency is its stunning island called Misool. It is the home of beautiful karsts mountains and other nature attractions like beaches, after all. As for reference, there is Panun Beach. Despite the plain appearance, the beach offers a calm and charming nuance. It is also suitable for numerous fun activities like swimming, diving, snorkeling, and sunbathing! Visitors can come to the location either alone or with a companion, including families and friends. They can also take advantage of the beach for photography. In terms of nuance, Panun is simple but beautiful. The crystal clear water is the main attraction there. It also features creamy and soft sand, on which tourists can conduct beach walking. In the horizon, visitors are able to witness beautiful lush hills and nearby islands. The seawater is shallow and warm, too. It makes the beach a perfect location for swimming and snorkeling. Due to its excellent visibility, tourists can explore the underwater objects and feel the comfy water wholeheartedly! What’s more? Some traditional canoes are seen in the shoreline, as the villagers leave them there. It is possible to ride on it, in fact. As mentioned before, Panun Beach is suitable for water sports. Thanks to the good atmosphere and superb nautical environment. For tourists, the best thing to do in Panun is to go snorkeling and diving. It is because they need to see the richness of nautical beauty, including corals and sea creatures. Some octopuses are often seen underwater, in fact. Their size varies and their appearance is quite majestic. When it comes to the best time to perform snorkeling, it is between May and September, when the weather is calm. The next fun activity is beach walking. With the cream-colored sand, the beach lures more tourists to get around on it. It feels nice and comfortable walking on such landscape, after all. During such activity, they can also witness the flawless beauty of the sea and enjoy the gusty wind. Even the heat of the sun doesn’t become an issue there. Still, it is better to do beach walking either in the morning or afternoon. At the times, the weather is cool and refreshing. Not to mention there is the chance to witness either sunrise or sunset. Another good idea is to ride the abandoned canoe or fishermen’s boat. It is likely the owner of the boat allows tourists to use it, as long as during the idle time. At the end of the vacation, tourists should visit other stunning beaches in Misool Island. These include Olobi, Daram, Malili, etc. All of them are worth a visit. Also, don’t forget to visit Wayag Island, which is quite famous among travelers! For those coming from other provinces, an airplane is a good choice of transportation and the destination is Sorong City. That means tourists need to reach Domine Eduard Osok Airport, which is located in Sorong. Next they should visit Sorong Port and rent a speedboat. 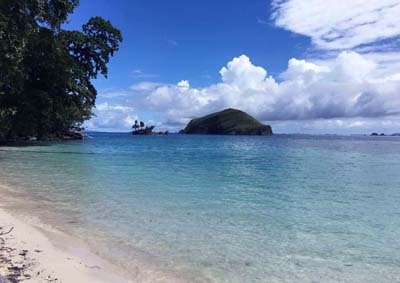 The last destination is Misool Island, where Panun Beach is located.